Designed in Italy and made in Mexico, Amoretti Brothers’ cookware is some of the most beautiful you’ll ever see. Every piece is individually crafted by master coppersmiths from shiny copper, decorated with a hammered pattern that’s applied to the inside and outside of each piece by hand. Copper cookware doesn’t get any more fine. The Copper Mixing Bowl from Amoretti Brothers is the perfect blend of durability and style. Like all of the brand’s cookware products, this one features a stunning hammered copper design that’s simply overflowing with elegance and class. 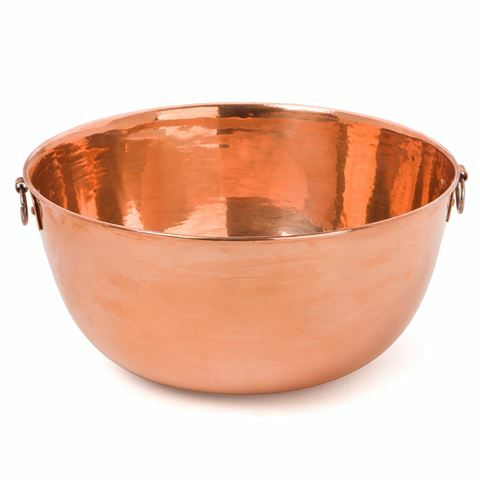 Made from copper, this mixing bowl will give you a quicker and more even cook than kitchenware made from other materials – saving you time and helping your food taste even better. Don’t miss out on this incredible item from the masters of copper cookware. Designed in Italy and made in Mexico by skilled local artisans. Copper pans provide a quicker and more even cooking experience. Apply copper polish to retain your cookware’s shiny appearance – however, keep in mind that your Amoretti Brothers cookware will change colour over time, which is a natural process and won’t affect the performance of your cookware.. Beautifully presented in a Amoretti Brothers wooden crate. Dimensions: 30cm (d) x 15cm (h).